Saturday Morning Breakfast…On Wednesday Night? Ever since I was little, my Mom has made a meal called Saturday Morning Breakfast. We rarely had it on Saturday, but somehow the name stuck. I honestly have no idea where the name came from, but that’s what its known as, and will forever be known as. The name might not make sense, but ohmygoodness. It it should have its own food group named after it. Grains, vegetables, fruits, dairy, protein and Saturday Morning Breakfast. Sounds good to me! It wins the hearts and taste buds of anyone who tries it. My husband is now a firm believer in Saturday Morning Breakfast, and you should be too! 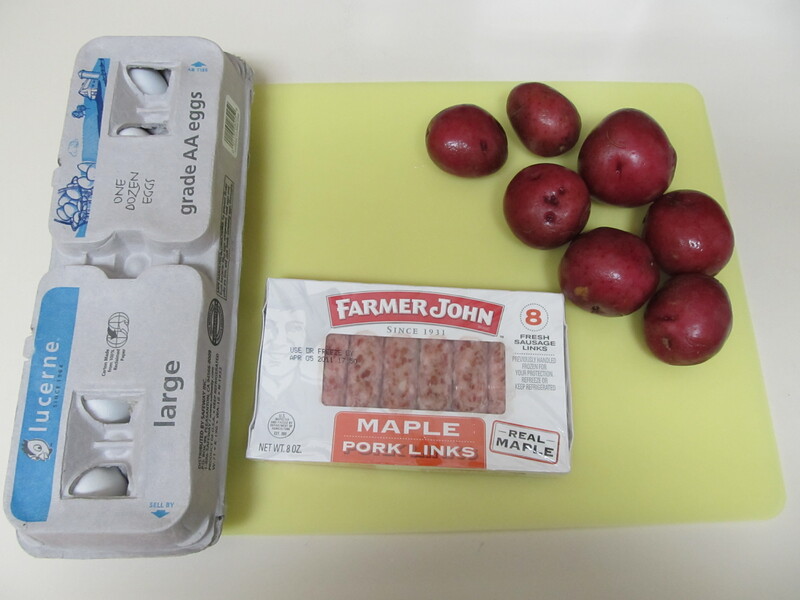 For tonight’s dinner, I used 5 eggs, 8 sausage links and 7 very small red potatoes (which ended up being too many, I should have gone with 5 or 6). You’ll also want to add onion powder, garlic powder, salt and pepper. My Mom makes it with onions and peppers sometimes, but if you’re like me and have an aversion to such grotesque things, you can substitute with onion powder and some hot sauce. In a large frying pan, start cooking your meat. Whether you’re using sausage or bacon, you’ll want to cut the meat into smaller 1/2 inch-ish pieces. While the meat is cooking, start cutting up your potatoes. I like to use red potatoes but you can use russets as well. I leave the skin on the red ones, but definitely peel the russets. Cut them into bite sized chunks. By the time you’re done cutting potatoes, your meat should be most of the way done. Remove it from the pan and set aside. Keep 1-2 tablespoons of the grease (is the term oil more appetizing? I’m not sure…) and discard the rest. Throw your potatoes (maybe not throw…gently set?) into the frying pan with the left over oil/grease and season to your hearts content. I use onion, garlic, salt & pepper. But use whatever sounds good to you! Cook the potatoes until they’re fork tender. Crack your eggs into a separate bowl and whisk them until they’re scrambled. 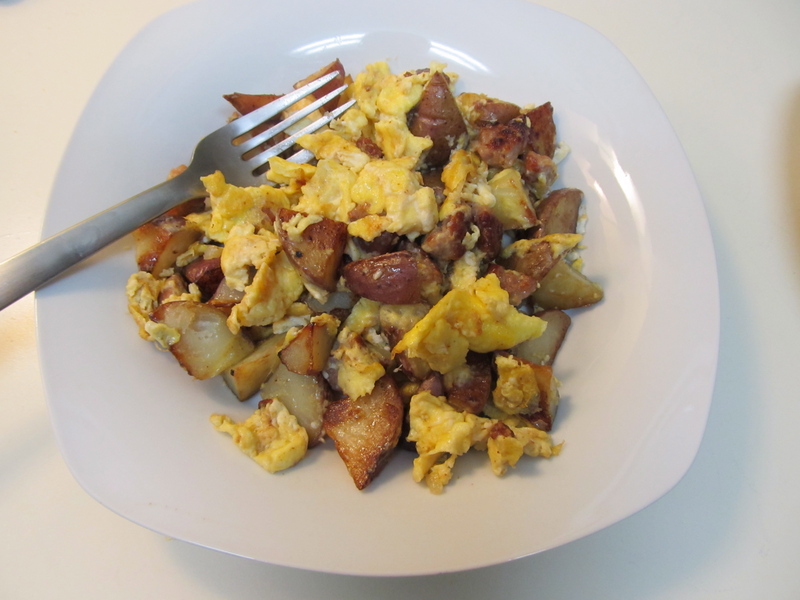 Once the potatoes are tender, put the meat back in the pan and pour the eggs over the top. Let the eggs cook a bit and mix. Cook, then mix. Do this until the eggs are completely cooked. Voila! You have Saturday Morning Breakfast!! You can add a plethora (sweet word, yeah?) of toppings to make this delectable delicacy even better. Cheese, sour cream, hot sauce, green onions, ketchup…even mayonnaise (don’t judge me). Hope you enjoy this recipe! It’s something that my family loves and I hope you do too! ← Spring has arrived at Casa de Edwards!